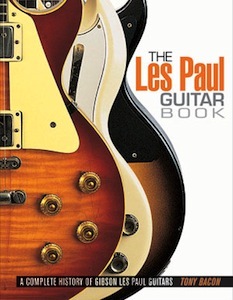 This was our new revision and update of 2009 that brought together some of the content from the original Gibson Les Paul Book of 1993 and the larger softback format that we first experimented with in 50 Years Of The Gibson Les Paul in 2002. I took the opportunity to rewrite and update quite a bit of the main story and the reference section, as well as rework the picture pages. There’s a short extract from the reference section for you to look at when you click here. 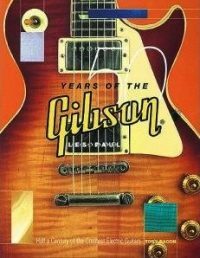 The original Gibson Les Paul Book from ’93 was the second book that Nigel Osborne and I published for our new firm, Balafon. It followed the hardback format and general style of The Fender Book, our first effort. I wrote the main story, based on lots of research and the many interviews I did with Gibson people and players old and new. Click on the link here to read a bit of the interview I did with Jeff Beck. 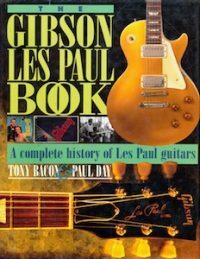 Seven years later, in 2002, we published an experimentally different update, 50 Years Of The Gibson Les Paul (jacket below), which was divided into decades.